The Harvest Time Feis hosted by the Heavey-Quinn Academy of Irish Dance took place Sunday at Burlington High School in Burlington, Massachusetts. 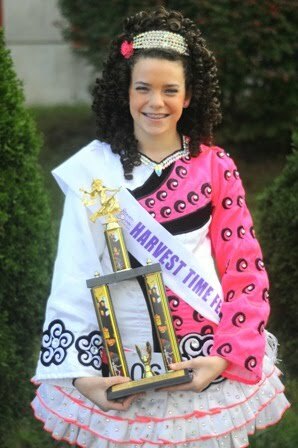 A big irish dancing competition weekend for New Englanders, Harvest Time follows the Neponset Valley Feis hosted by the Harney Academy of Irish Dance held on Saturday. Many dancers travel to Massachusetts for both events and enjoy the fall foliage and beautiful weather at the same time. This double-header weekend of Irish dancing is an important event leading up to the regional Irish dancing championships held in November and champion-level Irish dancers in particular seek out constructive criticism from adjudicators while practicing new choreography in a competitive setting. Ceili teams received performance on stage practice as well to the delight of many teachers who will bring 4-hand and 8-hand teams to the regional Irish dancing championships next month. The experts at FeisWeb tabulated results, and we share some of the Top 3 results here. For full championship level results, visit FeisWeb. Special congratulations to those dancers who achieved perfect scores of 300 - Clare Murray Macritchie, Samuel Miller, Siobhan O'Neil, Jacob Parkman, Simone Rodriguez, Brianna Sheehan, and Maeve White. 1 Maeve White (Brady) with a perfect score of 300! 1 Samuel Miller (Goulding) with a perfect score of 300! 1 Brianna Sheehan (O'Shea-Chaplin) with a perfect score of 300! Kiera Bulger and Anne-Marie Miscioscia from Nevin Academy. Subscribe to Feis America, North America's favorite Irish dancing magazine. Digital subscriptions and digital back issues are also available.